Start May with a bang — or rather a splash with Scuba Dive from Elite! Nuclear Countdown from Atlantis! Karyssia Part III from Incentive! Surface Tension from Powertape and all with a side order of scrummy Pokemania! It’s a Wednesday morning and all’s well at CRASH HQ — ’cos Mark Caswell has bombed off somewhere to play the coin-ops! Second Century China, ahoy! It was the place to be if you wanted to get involved in Dynasty Wars! Win, Win, WIN a jolly strange Eye Of The Storm and heaps of t-shirts and games thanks to Thalamus! 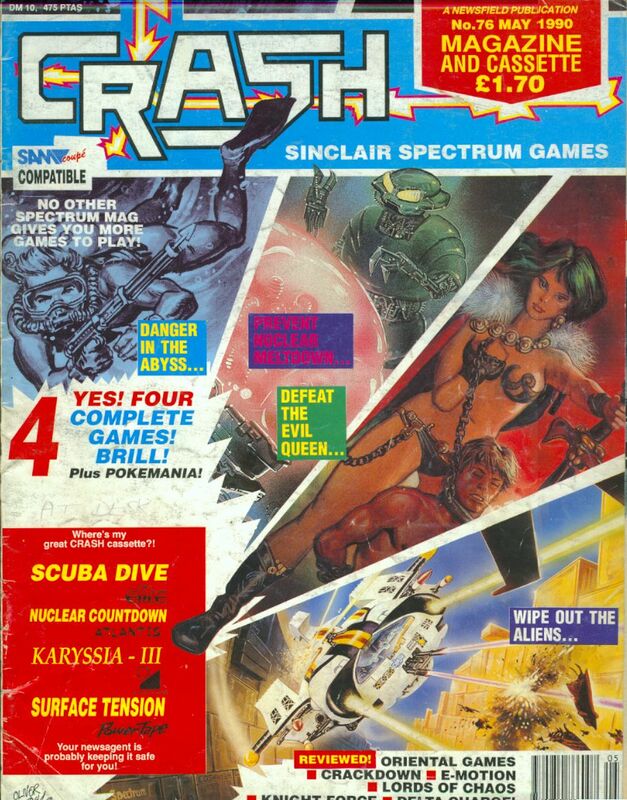 It’s the happenin’ section abounding with fun as Lloyd rummages through your letters, checks out the high-scoring heroes, announces the winners and gets you up-to-date with all the latest Speccy news! Especially for SAM Coupé owners — there’s the SAM forum and more! Get unstuck from the stickiest situations with DJ Nicko as he reveals all the tricks, cheats and tactics on the games you can’t beat! It’s the Easter games parade! Impossamole! Hot Rod! Fiendish Freddy! Crackdown! E-Motion! Castle Master! Delta Charge! Knight Force! Oriental Games! and Lords Of Chaos! Cheap and cheerful — thats our DJ Nicko (Hem, hem)! And here you’ll find: all the cheap games, but how cheerful are they?! No need to be a wimp anymore! There’s a set of ten martial arts lessons to be won right here!